New AU Pricing!! $5 per month, or even bigger savings with a $25 yearly subscription. Never forget why or where you snapped a project photo. Whether you are walking miles of roadway to capture existing conditions, documenting sidewalk accessibility, or working on a signage inventory PhotogeoDWG can instantly build your documentation and help when you want to share with your design team. PhotogeoDWG assists by showing you the location where you took the photo with a marker rotated to match the orientation you were standing when you took photo. The app will place a raster reference of the photo in the drawing, and it will automatically insert labels into your drawing. Complete documentation in minutes instead of days! PhotogeoDWG Pro is the much anticipated update for the award winning photogeo developed for older versions of Autodesk® AutoCAD® and Autodesk® AutoCAD® Civil 3D®. 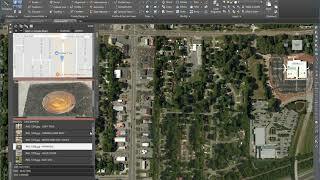 This version supports all geo-coordinate systems delivered with AutoCAD/Civil 3D. It has an updated GUI that implements AutoCAD's light and dark themes. And it includes many new commands to help you manage your photos including data editors, CSV export tool, position updater, plus bulk placement of images and labels. With this version you are not limited to markers - complete documentation of hundreds of photos in seconds by automatically placing markers, photos, and labels. Code signed MSI for better install experiences. 01.02.01.23 fixes place photo command on right-click menu. This is one of the best, most useful, and reliable apps I have ever used! How many times have you wanted to take some photos in the field, get back to the office and ask yourself, "Hmm, I wonder in my drawing where I took that photo?" Well, this app completely solves that question. I have used it to do estimates, and verify locations of culverts in CAD from the field. I have also used it for presentations to lead engineers to show them where design issues occur, as there is a hyperlink applied to every photo block in CAD so that you can easily see the real-world view. For me, every job starts using photogeo.